The time has finally arrived (yeah, sorry for being a bit late): we're launching our 31 Days of the Dragon giveaway contest today. All the details about what's in the giveaway bundle can be found here, but the short version is that it's a pimped out-to-the-max HDX9200 notebook PC worth about $5000 if purchased at retail. The laptop features an Intel Core 2 Extreme X9000 CPU (2.8 Ghz), 500 GB of storage (2 x 250 GB hard drives), 4 GB of RAM, integrated HDTV tuner, fingerprint reader, nVidia GeForce 8800M GS with 512 MB of RAM, a 20.1 inch WUXGA screen (1080p, 1920 x 1200), and lots more. The software bundle includes Office 2007, three Blu-ray DVDs, and more. I'm reviewing it, but when I'm done (on or around the 17th of May), I'm giving it away to one of YOU. If you don't already have a YouTube account, create one (it's free and fast). If you have one already, you're golden. Jump over to the YouTube page where the HDX9200 unboxing and first impressions video is posted. Watch the video, rate it, and post a comment on the YouTube page. Your comment should answer this question: "How will the Dragon rock your world?" Meaning, if you were to win the HDX9200, how would it change things for you? Would it allow you to get rid of your current computer, monitor, keyboard, and speakers? Would you come up with creative uses for a powerful workstation that could be moved - could you finally launch that mobile music recording studio business, be a wedding photographer and edit photos on the spot, or would it allow you to achieve some other goal? Or would you just revel in the sheer power of being able to play games and edit movies faster than ever before? Tell me how you'd use this powerful computer! After you've posted your comment (only one comment per YouTube account), click on the yellow Subscribe button to subscribe to the Thoughts Media YouTube Channel. If you want to double your chances of winning, also post your comment here on Digital Home Thoughts as a reply to this post. Please post your YouTube username as well so I can verify that you've subscribed to our YouTube channel and posted a comment there. If this is your first post to Digital Home Thoughts, please allow up to 24 hours for your post to appear. I'll randomly select one person from the combined total of all the YouTube comments and the comments here. That person will win the laptop. Boom! 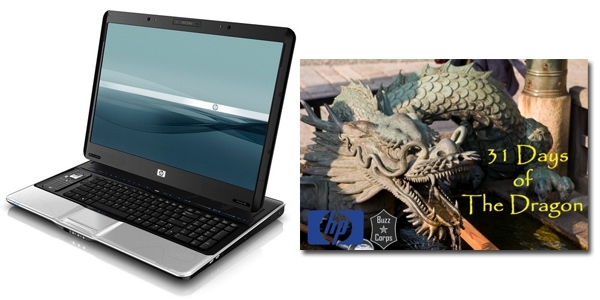 Anyone in the world can win this laptop, thanks to the generous support of HP and Buzzcorps - it will be couriered to you. The fine print about how I'm doing the random selection: When I do the random drawing, I'll do it from a combined total of all the YouTube subscribers and all the comments posted here on Digital Home Thoughts. Each YouTube subscriber and each comment posted here on Digital Home Thoughts will be assigned a numerical value, and I'll use random.org to pick a random number from the total. That's why if you post a comment both on YouTube, and here, you'll double your chances of winning. When I select the winner I'll be checking it against the comments, so make sure you fulfil all the contest requirements. If the person that is randomly selected hasn't followed my instructions, another winner will be chosen. If you have questions about the contest, please don't post them here, only post your contest entries - send me a message with your questions using our contact form and I'll update this post with further details if I've forgotten anything. I hope everyone has fun with this contest! *** UPDATE: PLEASE READ THIS. *** I just finished approving 65 (!!) new posts for this contest, and over 10 of them were duplicates. ONLY POST ONCE. You will not see your post right away if it's your first post to this site. It's held in moderation, then will be approved and will show up. Post ONCE, then come back in 24 hours and confirm your post is here (it will be). Anyone who has more than one post in this thread will be disqualified. *** UPDATE #2: PLEASE READ THIS. *** If anyone posts more than once to this contest thread, or to the YouTube comments, they'll be disqualified. I just spent 30 minutes cleaning up more than a dozen posts in this discussion thread from a single user. I appreciate everyone's enthusiasm for this contest, but because each post is an entry, I can't allow more than one entry per person per location (one entry here, one entry over on YouTube). When I randomly select the winner, I'll be searching through all the discussion posts and if that person has posted more than once, they'll be disqualified and I'll pick another winner. That's the only way to keep this contest fair.